Rao's, the Las Vegas outpost of East Harlem's legendary Italian eatery, recently celebrated its first anniversary at Caesar's Palace. Even if you missed the festivities, however, you'll enjoy the energy and enthusiasm that marked the special occasion. Indeed, both were still palpable at this noted Southern Neapolitan Italian restaurant a few days after the party, when TravelsinTaste.com had the distinct pleasure of catching up with Executive Chef Carla Pellegrino, who offered us the inside scoop on her background, as well as on the amazing chefs from whom she's learned and the equally amazing cuisine for which she's known. Check back soon for our full listing on Rao's. Chef Pellegrino is no stranger to the kitchen. In fact, she's been cooking since the tender age of 10. Her mother had a catering business that she started, managed and grew by herself, so she had to rely on young Carla for help with larger parties. Ever since, Chef Pellegrino has been determined to hone and enhance her culinary skills. She did just that when she decided to pursue an excellent education at the French Culinary Institute ("FCI") in New York, where she was part of the 1999 graduating class. 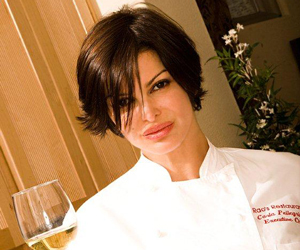 "I had the honor of learning with the best people," she says, "like Jacques Pepin, Alain Sailhac and Andre Soltner. But the chef that was really working closer to me at the time was Dominique Cerrone, former chef de cuisine of Le Bernardin and one of the deans of FCI now; I like to think of him as my mentor."